New York Republican gubernatorial candidate Carl Paladino has already set some kind of record for dirty campaign tactics with his garbage-scented and poop-themed mailers. But now he's gone mud-slinging-crazy, leveling unsubstantiated charges of infidelity against his opponent, Andrew Cuomo. 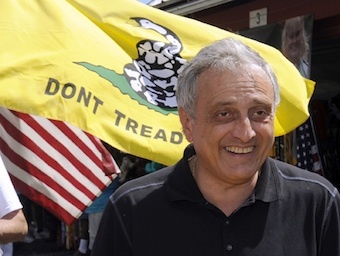 Politico reports that the Tea Party-backed Paladino let the allegations slip during a bout of rage over the press covering his own extramarital affair and 10-year-old lovechild. "Has anybody asked Andrew Cuomo about his paramours?" Paladino told POLITICO, as campaign manager Michael Caputo chimed in, "when he was married." Paladino continued, "When he was married - or asked him why his wife left him or threw him out of the house? Has anybody ever done that?" he demanded. "What are they doing intruding on my life?" But we're confused. Just a few days ago, Paladino was attacking Cuomo's lack of testicles. How could Cuomo cheat on his wife if he has no testicles? If Paladino can't even keep his absurd smears straight, there's no way he'll be able to break the deadlock in Albany.